I know a wonderful woman named Sue. She has soul. Her river runs deep. 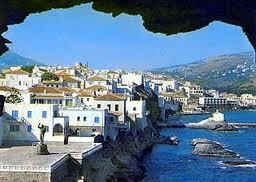 Sue lives in Athens and now and then escapes to the beautiful island of Andros in the Cyclades. How I long to return to Greece on day and spend a late summer on a Greek Island. Sue has a gift. She is able to take me there with her words. Sometimes I spend entire days walking beside Sue, hearing, seeing, and breathing her beautiful descriptions. She has the gift to transport me back to those days when I too experienced the beauty and magic of Greece. At the moment Sue is on Andros. The 100 graces below are Sue's. I would like to share them with you. They inspire me to use all my senses in experiencing and being thankful for the simple things in my life. I hope they will do the same for you. Thanks Sue. Your generosity in allowing me to share your beautiful graces will be infections is such a beautiful way. I haven't written 100 graces for a long time. I just felt like it today. 1. A magical day. The Chilean miners gave me the courage to take the ferry alone to Andros, something I haven't had the energy to do for years. 'If you can do something, do it,' they said, and I was listening. 2. The way Chile gave the world a reason to be happy. 3. Memories of being high up in the Argentinian Andes and how in a tiny sprawling village there I found an internet shop and a girl speaking perfect English who apologised for not having broadband! This, at a time when we didn't have broadband in Athens. 4. Being outside in nature just before dawn. 5. A dark blue sea with shifting lighter patches; dark blue hills tranquil in grey mist, a single walker out with his dog - just before dawn. 5. Standing on deck in morning sunshine, soft warm breeze on my face, cliffs of the island gliding by. 6. After a week of winter and rain, a clear radiant tranquil day of brilliant sunshine. 7. Stripping off to my bikini on the verandah. The exquisite warmth on my skin. 8. The luxury of being outdoors all day. 9. The quiet; the fresh clean air. 10. The surprising heat of the October sun. 11. Lying on pristine sand on the deserted beach with the sun radiating light and summer heat through ideally temperate air. 12. The beauty of that beach today takes my breath away; it's the quality of the light after the rain. 13. An arbour of tree fronds stretching to where sparkling water laps the sand. 14. Autumn leaves falling into the surf-like fringe of incoming waves. 15. Sparkling smooth pebbles. Smooth majestic rocks enclosing the bay. 16. A single white-washed taverna, its trellices laden with vines, its blue shutters closed for winter. 17. An elegant small yacht moored within swimming distance. 18. The quiet murmur and laughter of the only two swimmers in the bay. 19. The silence enabling this laughter to be heard up at the house. 21. Walking along the shore singing, three plump ducks happily leading the way. 22. My toes surprised by even colder water which runs into the sea from a hillside stream. 23. 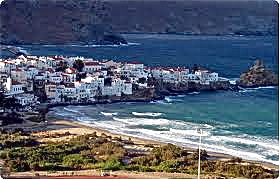 The curved hillside behind the beach with its tiny white-washed cottages and olive trees. 24. The sound of creaking branches. 25. The sound of a single pine cone dropping to earth. 26. Being lazy, because it's time to be. 27. Knowing that 'just being' is just fine. 29. Not using the computer for a whole day. 30. Not using my brain for a whole day. 31. Not driving for a whole day. 32. Not wearing a watch. 33. The way there are only natural sounds here. 34. Deciding to learn Spanish after my French. 35. Being so happy about the fact that finally, after several years, I can be outdoors all day without adverse effects on my metabolism. 36. Ecstatically enjoying the rich aromas of wind and earth again. 37. Realising I don't want to go back to the city this winter. 38. Realising I'm out of synch with the seasons. I want it to be warm so that I don't ever have to go indoors again. 39. I can envisage one day swimming in the sea and not in a pool - such a possibility would have been beyond the realms of imagination even a year ago. 40. The potential of the human spirit, and mind, and body. 41. Going out onto the verandah before dawn; watching the stars fade. 42. Watching the last bat fly across the terrace. 43. Watching clouds appear with the dawning light, shifting across the brightening sky. 44. How those clouds mingle and part, their blush spreading across the whole sky, before brightening to white. 45. The first hungry kitten brushing my legs and miaowing when it's still dark. 46. An early/late cricket screeching. 47. The first birds singing. 49. The sea lapping the shore beneath the cliff. 50. The hillside being still and silent enough to hear all these sounds. 51. Ten minutes after dawn, at 7.10, it's light enough to continue reading my book outside. 53. Walking to the beach in early morning sunlight. 54. Sitting on a stone wall in town, looking out over the harbour with its fishing boats. 55. White-washed houses with blue shutters and red-tiled roofs rising up the gentle slopes all around. 56. The joy of just being outdoors. 57. Watching fisherman sell their catch to local householders from an orange, white and sky-blue wooden boat crafted in a nearby boatyard. 58. Just strolling, with no particular place to go. 59. Sitting in a yellow deckchair on the verandah while kittens play around me. 66. - a bee-eater singing in the bushes. 67. A baby lizard frolics on the wall by the geraniums. 68. The smell of thyme and herbs and freshly sprouting wild grasses. 69. The smell of warm moist soil and sea-salt, brine and jasmine. 70. A majestic bird with a huge wing span gliding and circling in the bay. It has white body and wings, a black tail and head. 71. A cat frisking along with me down to the beach. I've never been for a walk with a cat before. 72. The positive power of faith (I'm thinking of the miners again). 73. How this power is not dependent on the proven existence of the object of faith. 74. Not feeling guilty for being here in paradise. 75. Seagulls falling seawards like white handkerchiefs suffused with sunlight against a blue sky. 76. Fridge noises, and the way Will Self wrote about them. 77. Reading late into the night because the book is so good I am totally immersed in its world. 78. Reading outdoors in comforting warmth. 79. Being alone and able to read without interruption. 80. Being alone so that thoughts can flow like a river. 81. Bottled water from springs in Northern Greece. 82. Not being scared of my own body and its unnerving quirks. 83. My metabolism's unreliability becoming a thing of the past. 84. That up to number 84 I didn't even have to search for graces; they just flowed. 85. Letting go for two days - of work, worry, obligation, planning, figuring, assessing, post-mortems, guilt, resentment, judgement, anger, self-criticism, fearfulness. 86. How fear dissolves in sunlight. 87. Letting go for two days - of meditation, positive imaging, yoga, rebounding, daily recuperative targets, e-mailing, cooking nurturing food, shopping for health, taking supplements, doing foot exercises, thinking about any of this. 88. Letting go for two days - of talking, socialising, thinking of others, thinking of myself, thinking of the world, thinking of anything at all. 89. Letting go of - writing my book, which is what I've always done in the past when I was here alone. 90. Lying on the verandah in the midday sun along with the lizards, gazing unfocussed through the holes in a straw-weave sunhat, and purring. 91. There is nothing in my world but graces today. Graces abound all around me. My minute by minute is one big Grace. And it's an even bigger grace that it can be so; that I can live in such a world for a day. 92. Books with comfortably large print. 93. I've shed a few pounds in weight - and hopefully cholesterol - since the summer. 94. My ex-husband, for maintaining this house and a little old car, on the island ready for all the family, including me, to use. 96. The way I love writing graces. 97. The way that when I need a hug, I hug and cuddle for hours and hours until my body tells me that my energy boxes are full. 98. In the same way, how when I need sunlight on my body, I stay outside for days until I am sated, and only then move indoors. 99. Sunlight shining through bright red bougeanvillias. 100. Back to the Chilean miners and that first note they sent up. 'We are all alive and well - all 33 of us.' It's so noble, so understated. Not 'we are starving' or 'help us' or 'get us out of here'. No drama, no playing the victim. 'We are all well.' Just that. Such a lot for me to emulate and take inspiration from there. The 100 graces are so touching and inspiring. I love the idea of just writing them and extending it over a several day period. I would love to try it sometime. Thanks for sharing!! Yes, Greece is magic. At least that's the memory I have. I try to write 5 graces a day. Don't always get there, however, it really helps me to keep things in perspective. I loved Sue's 100 graces which flowed so easily from her spirit. Thanks for dropping by, Patty. Aw the graces, what a nice tribute to the beauty of life and all it has to offer. I'm still journaling mine in private now...but I will share at the end of the year. Sue's graces just made me want to get back to GISt, on the other hand, as you noted before, anywhere is a good place to remember the graces. Thanks for sharing Lady D.
By the way, the first and last time I was in Greece I lost my passport and cried my eyes out. What beauty in these photos. Loosing your passport! Not a nice experience. Yes, we can write our graces on a napkin in a restaurant - as long as we acknowledge them. Thanks for dropping by Salma.